Forget English Lessons. Study CopyBlogger. Sure, aim to pass your exams, but don’t listen to the advice that you have to write long, complicated essays in order to get places in life. Rubbish. CopyBlogger teaches you how to write incredible, compelling writing (as in ‘sales copy’) but also how to market it - content marketing. Its about really nailing the fundamentals down; being able to write for prospects, search engines, re-tweeters, other bloggers, your mum... Its about getting results. Each post has some kind of challenge, that makes you think (and you don’t get that always in an English class, do you?) and so you get smarter. Its up to you to figure it out, as if the posts are trying to guide you through. Its definitely not just an instruction manual. 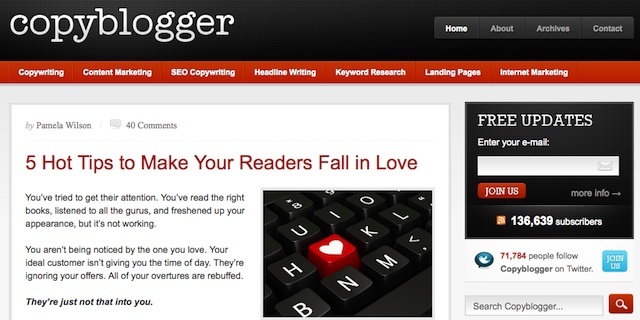 I’ve big respect for Brian Clark, Sonia Simone and the other CopyBlogger writers for keeping it clean. They’ve got a couple of ads on the right hand side, and occasionally promote Wordpress themes - but they’re not flogging their own wares all the time directly on the blog, like many others often do. You can avoid the promotions if you like - which is great for bootstrapped teenage startups. It means there’s a much higher ‘signal-to-noise’ ratio. This is one of CopyBlogger’s flagship free email courses which is engineered to culture these four pillars of online marketing. Darren Rowse at ProBlogger is a big partner. Although he is really just focused on blogging (and photography - his biggest project is Digital Photography School), he echoes the same principles that makes CopyBlogger great. And then there’s the softy-soft approach. Bloggers, pouring tonnes of effort into writing free for their readers, terrified of asking for a reward. The truth is neither side makes much money. It’s a shade expensive, but perhaps worth looking at once you’ve started pulling in some profit.